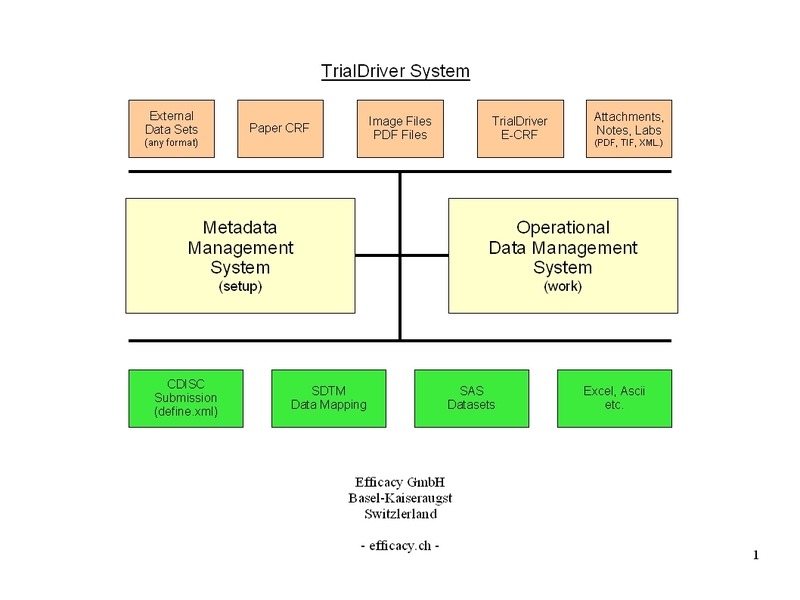 TrialDriver software has been designed to provide a complete image- and PDF-based Data Management solution for global clinical trials. It accepts a large range of inputs, including paper CRFs, image files and PDFs, electronic data from E-CRFs and/or legacy datasets. 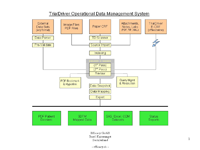 It provides comprehensive metadata creation and management facilities, including generation of operational databases, annotated CRFs, FDA submission documentation (define.xml) and SDTM data mapping specifications. 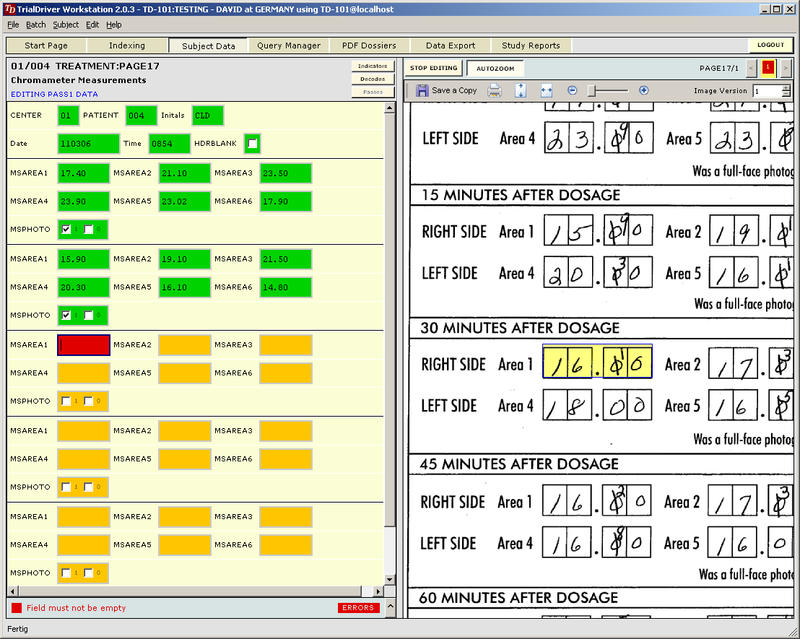 2-pass image-based data entry, complete query management, patient dossier creation and more. At the back end, data may be output in a variety of formats, including SAS load files, CDISC ODM data, Microsoft Excel format and others. 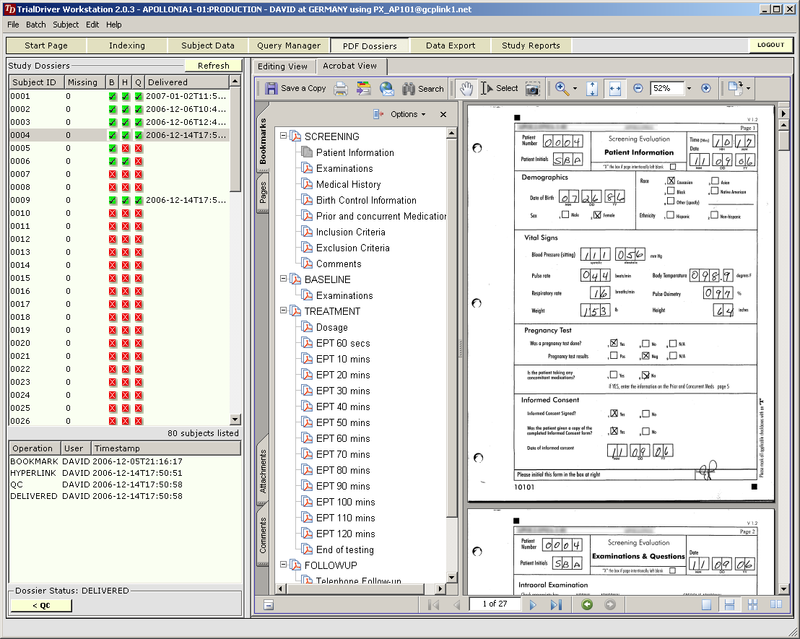 Prior to output, data may be mapped to an SDTM structure using an integrated ETL engine and mapping designer. 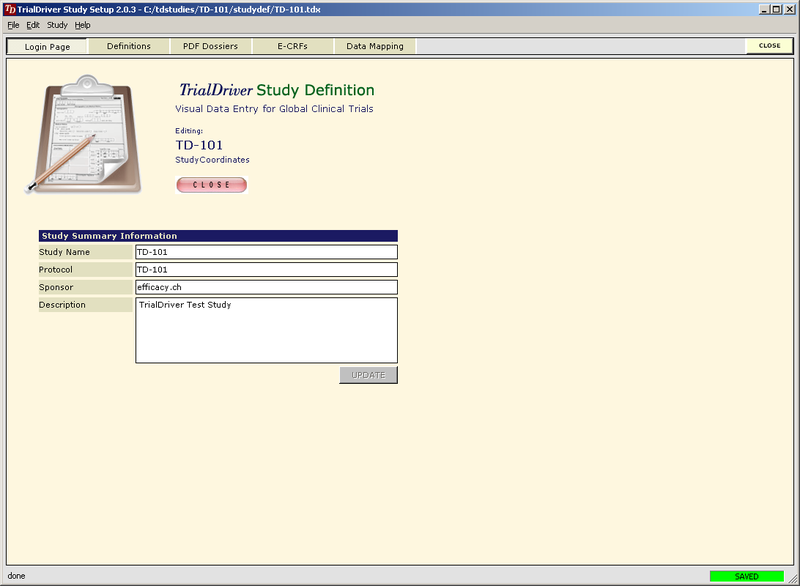 A small and easy-to-use program (TDSCAN), suitable for installation in the field at CRO offices, Phase I clinics etc, is used to acquire the source documents for a clinical trial. It integrates scanning software for the acquisition of paper based images with secure data transmission capabilities to transfer the input material to the clinical database server, which may be located anywhere on the internet. 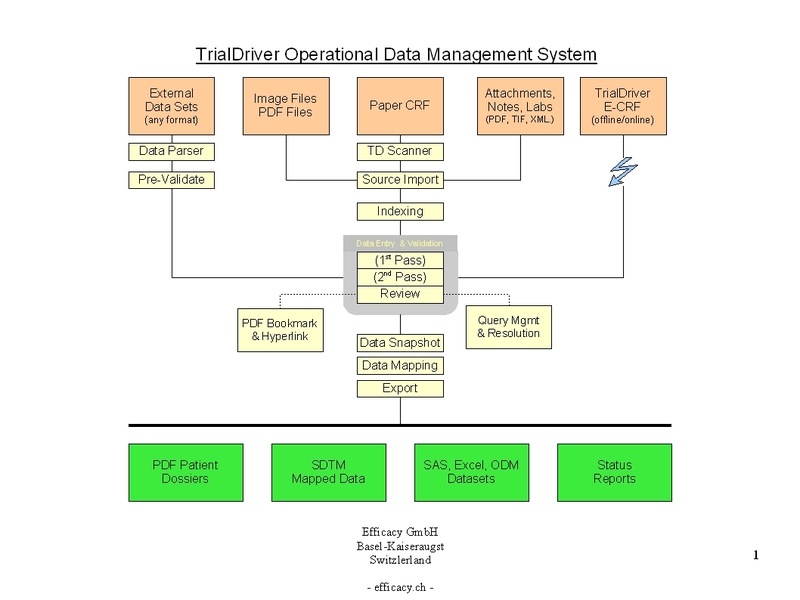 TDSCAN accepts data as TIF images (single- or multipaged) and/or PDF files. With these capabilities, this program can be used standalone as a simple and effective Image Transfer Agent, obviating the need to physically transfer paper from worldwide sources. 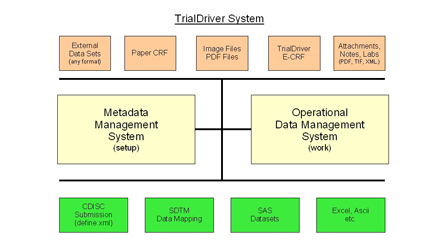 The TrialDriver Metadata Management module (TDSETUP), can be used to create a master study definition from which can be generated a variety of target files. These include the TrialDriver operational database specifications and control files, study-specific data entry masks, management related documentation such as annotated PDFs, submissions material such as an FDA-compliant database description (DEFINE.XML) and more. 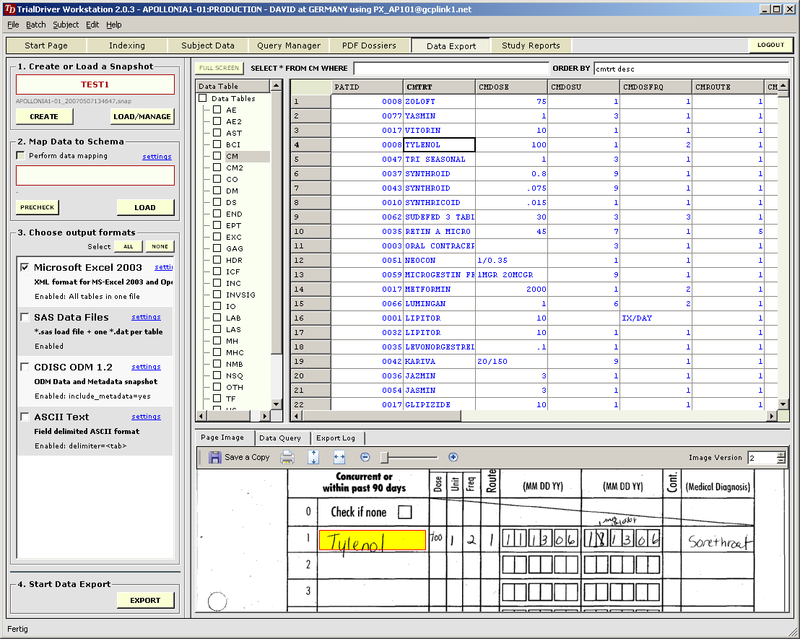 TDSETUP provides visual design tools to create database specifications and CRF based field definitions. With its’ image markup capabilities it can create operational specifications to drive and control an image-based data entry effort. Sophisticated data validation options can be applied to constrain data operator options, providing for high quality data immediately upon data entry. 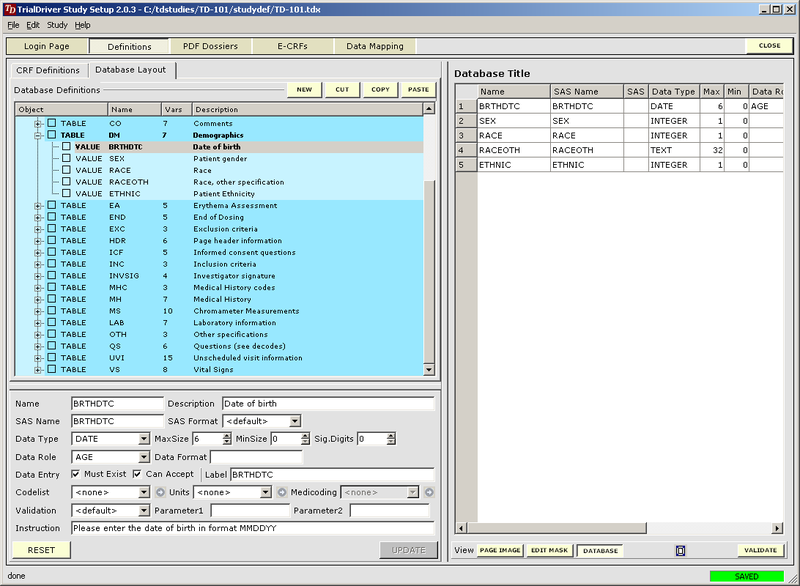 The program can collect and/or create a rich set of study metadata suitable for many different purposes. 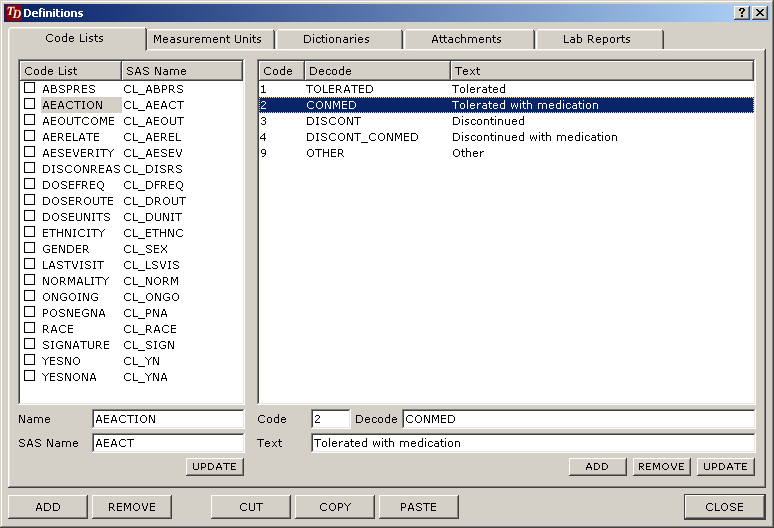 All parameters and values required for a CDISC ODM-based submission can be managed from within this module, including codelists, measurement unit definitions, attachment document types and more. 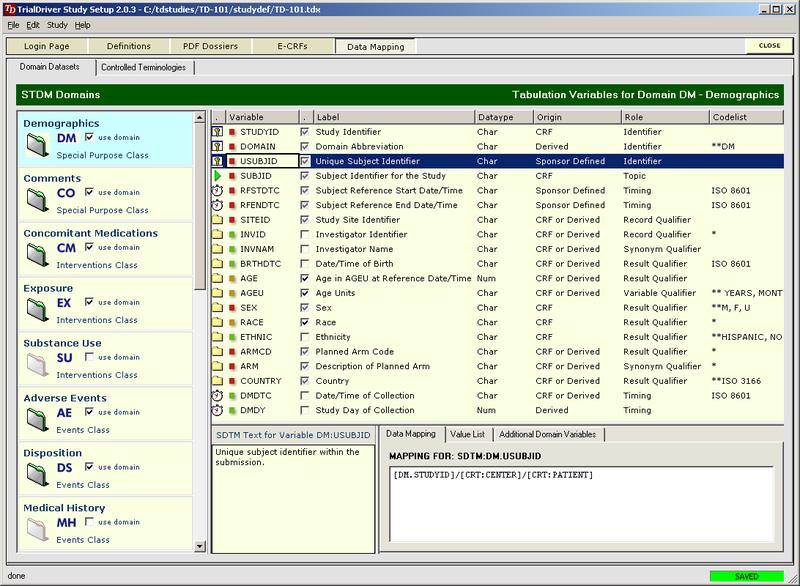 TDSETUP implements an SDTM designer interface to create a mapping definition which drives the TrialDriver ETL engine, transforming datasets from an arbitrary original database schema to a standard CDISC SDTM format. 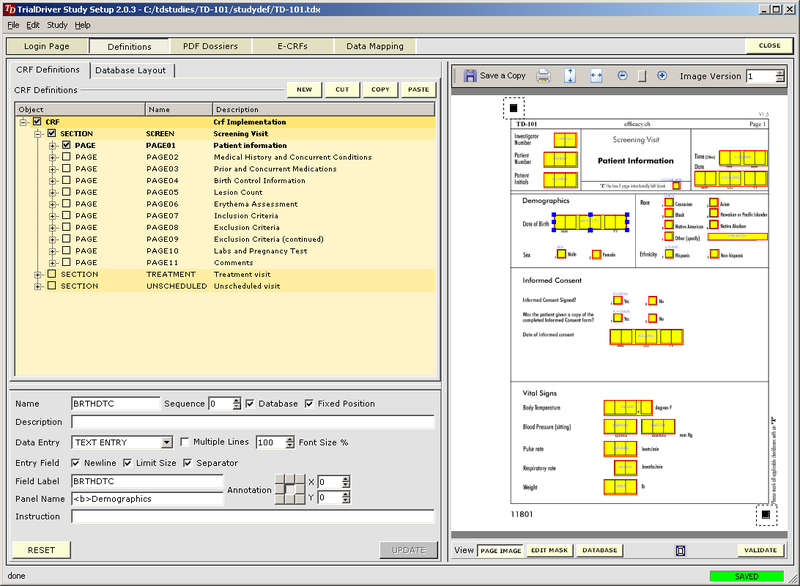 Additionally it provides a user interface panel for the creation, deployment and management of TrialDriver ECRF files and a design tool to facilitate the design of a PDF template with which to create individual patient dossiers. 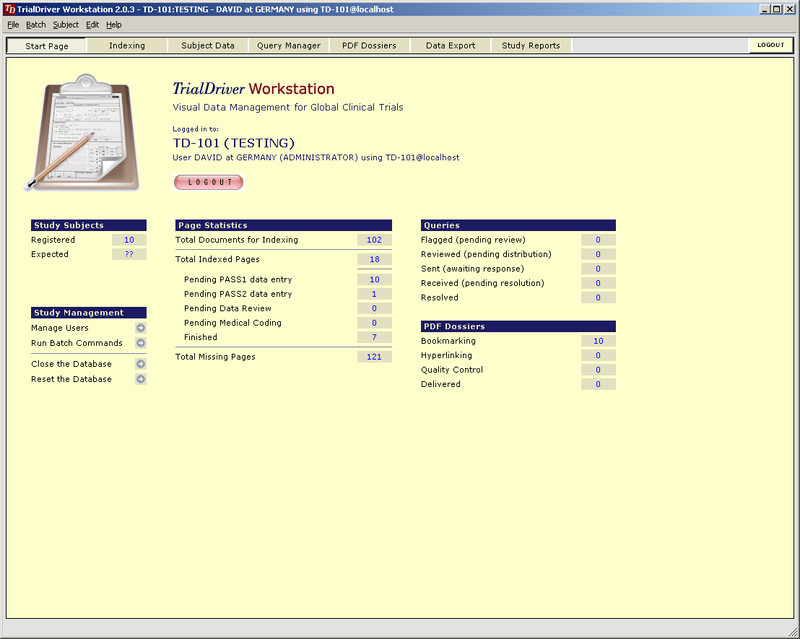 Core piece of the TrialDriver software is the work module (TDWORK), which provides a clear and simple workflow encompassing document-to-subject indexing, image-based, 2-pass data entry with discrepancy management (optionally single pass), a complete query lifecycle management system and comprehensive back-end data export, mapping and reporting options. 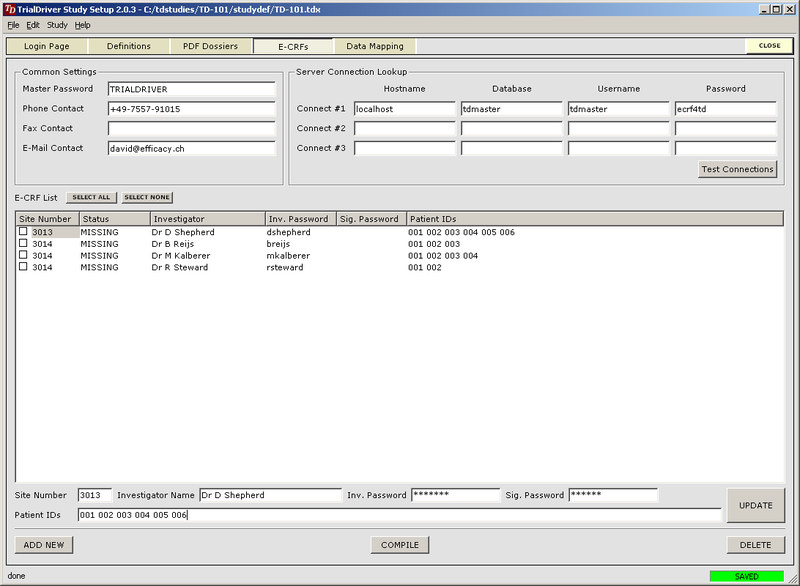 It has been designed for 21CFR11 compliance and features a rich set of administrative functionality, including secure, role-based user access and a full Audit Trail. TDWORK connects each study to a designated database server, which can be located anywhere, thus enabling global interoperations between participants and teams anywhere in the world. Source documents, whether TIFF images, PDF documents or external data records, are tracked in the system throughout each stage of the data entry effort. Document versioning is also implemented. 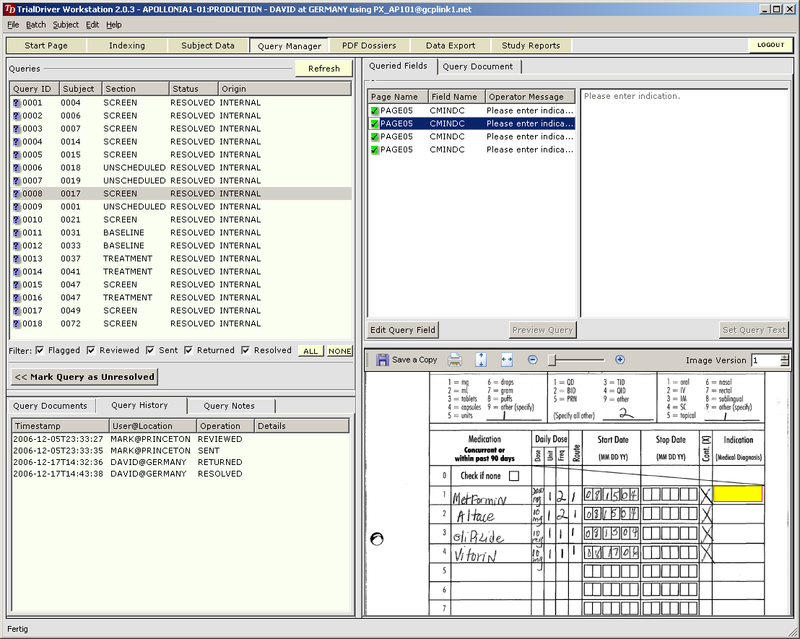 System users are kept continually informed of the status of subjects, their visits and individual CRF pages, and in addition the system will manage a wide range of material accompanying the main subject CRF, such as status of queries, lab reports and image, PDF or XML attachments of any kind. In summary, TDWORK provides a complete path end-to-end from the initial acquisition of source material through to the output of ordered, clean data sets for analysis and/or submission. 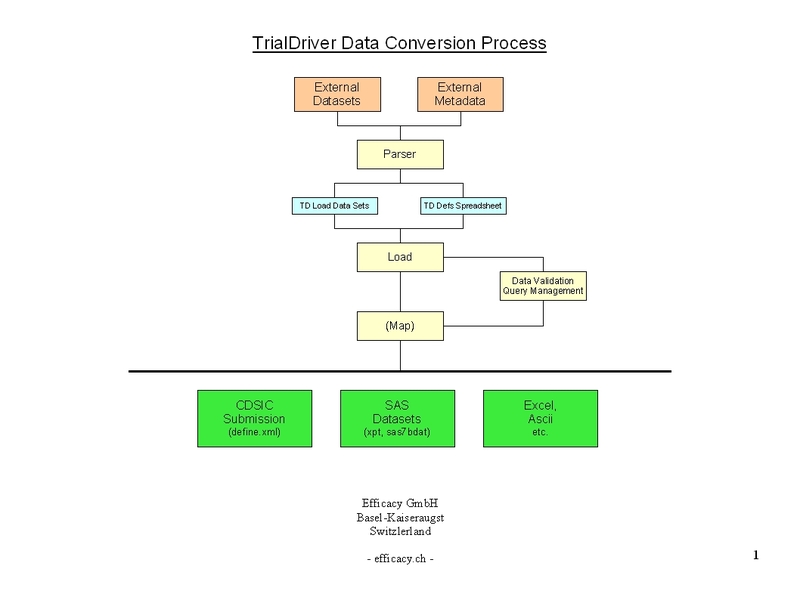 TrialDriver can import legacy data sets from any format and provide a clear and auditable path to convert these sets to a desired output format, such as SAS load files. To accomplish this, first a custom data parser is created for a given source format. 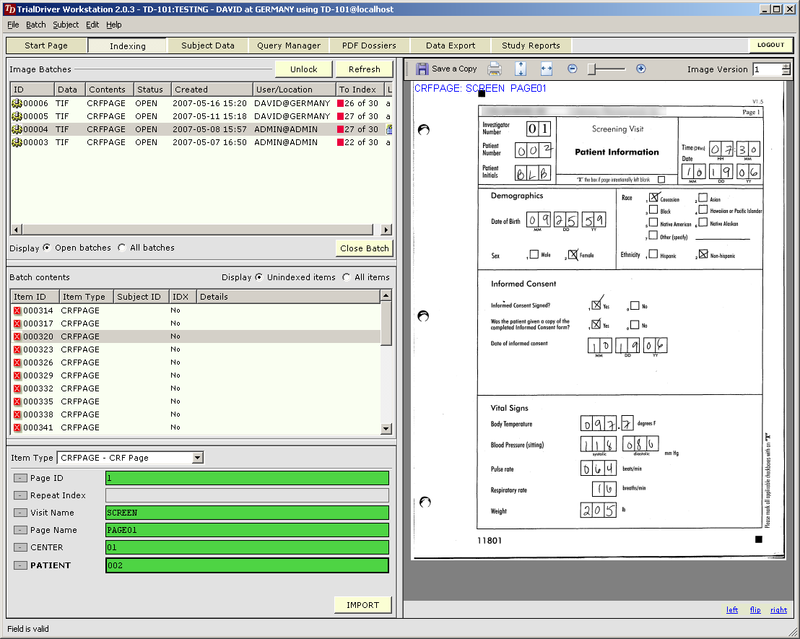 Output from this parser is a set of TrialDriver load files and an Excel spreadsheet containing the automatically calculated study metadata - field lengths and data types for example. The study sponsor can now optionally add metadata information to the spreadsheet - the amount of metadata to be provided is dependent on the purpose to which the final data will be put. For a simple format conversion, no extra metadata is required. 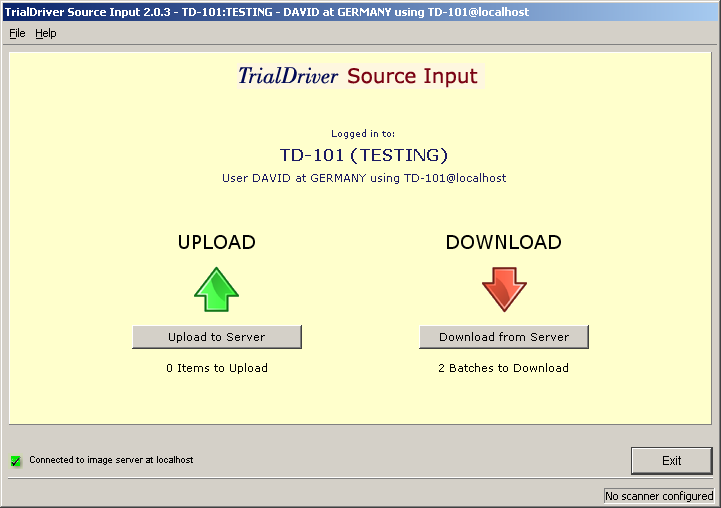 From this point on, the process follows exactly the same workflow as for any other TrialDriver study. Data can be queried, edited, mapped and exported with full Audit Trail functionality.